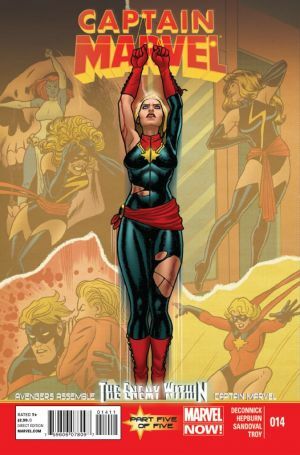 And so we reach the conclusion of The Enemy Within, the Avengers Assemble and Captain Marvel crossover event that’s really put Carol Danvers through the ringer. Avengers Assemble #17, the penultimate issue of this event, is a beautiful looking book. The art, colours, and page design are all truly stunning, but in particular Buffagni’s art is exceptional here. The faces are all expressive, poses are filled with movement and action, and body types are more realistically represented than in many comics, which for me, is something I really look for in a book. As usual, Kelly Sue handles the large cast of characters excellently, without it ever feeling like the focus has been taken off Carol. Along with Spider-Woman, Wolverine, The Hulk, Black Widow, Cap, Wasp, Hawkeye, and Abigail Brand, DeConnick somehow manages to squeeze Sersi in there as well. I honestly don’t know how she does it, the issue never feels cluttered or rushed, and I’m in complete awe of Kelly Sue’s writing abilities. The biggest strength in this book however, is the emotional response it generates in the reader. You really get a sense of hopelessness, so that while you know the Avengers will prevail, things aren’t going to turn out well for Carol. There’s always been a certain amount of dramatic irony in this storyline, but it comes to a head at the end, where anyone who’s been reading closely, or actually taken notice of the title of the event, finally gets that ‘AHA! I knew it!’ moment. Right after the big plot twist reveal, we’re confronted with an entire page of Carol lying prone and bleeding on the ground, eyes blank and unseeing, and it’s then you realise there might not be a happy ending here. 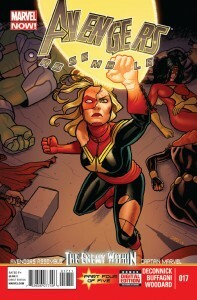 Moving on to Captain Marvel #14, featuring Scott Hepburn and Gerardo Sandoval as artists. Hepburn’s pencils are more consistent here than in #13, and it makes for a much more enjoyable issue than his previous one. The difference between the two artists isn’t as obvious as I though it may have been, but I certainly still have issues with Sandoval’s way of drawing body shapes – his version of Abigail Brand is particularly displeasing. Like AA #17, Captain Marvel #14 is action packed. There’s plenty of great action sequences, but also a more human element with Carol’s friends hiding in the basement as Yon-Rogg attempts to crush New York with New Kree-Lar, and some personal interaction between Yon-Rogg and Carol in the central part of the issue. Carol is broken. She’s weak, damaged, and at the mercy of her enemy, yet this issue has one of the best lines I’ve ever seen in a comic. As Carol stands over Yon-Rogg after summoning one last energy blast to knock him to the ground, we see her anger, strength, and a certain amount of resignation (and kudos to Hepburn for this panel, it’s excellent). What’s the line? Well you’ll have to read the book to find out! The final issue in this event isn’t anything less than brilliant in it’s hearbreak. DeConnick has crafted an incredible conclusion to an immensely satisfying mini-event, and I can’t wait to see which direction she takes Carol’s character in future Captain Marvel issues. Well done, Kelly Sue. The tears were worth it.